Timing, they say, is everything. Cliché, for sure, but BAE System’s strategic decision a few years ago to buy, invest and reinvigorate newbuild and repair operations in Mobile, Alabama, seems poised to pay off handsomely as the U.S. maritime market faces a historic rebound. As the energy profile of the United States changes, so too do the prospects for it commercial shipbuilding and repair sector, which virtually overnight has enjoyed an influx of new construction orders and general maritime business. The ATB and tank barge markets were long-thought dead, but with vast new sums of oil and gas in both the offshore and land-based being produced, so too comes the need to transport the goods to refinery and market, as well as the need to feed the inland energy production frenzy born from hydraulic fracturing, or Fracking. Shipbuilding and repair in Mobile, Alabama is certainly not novel, as Mobile holds a long and proud tradition. 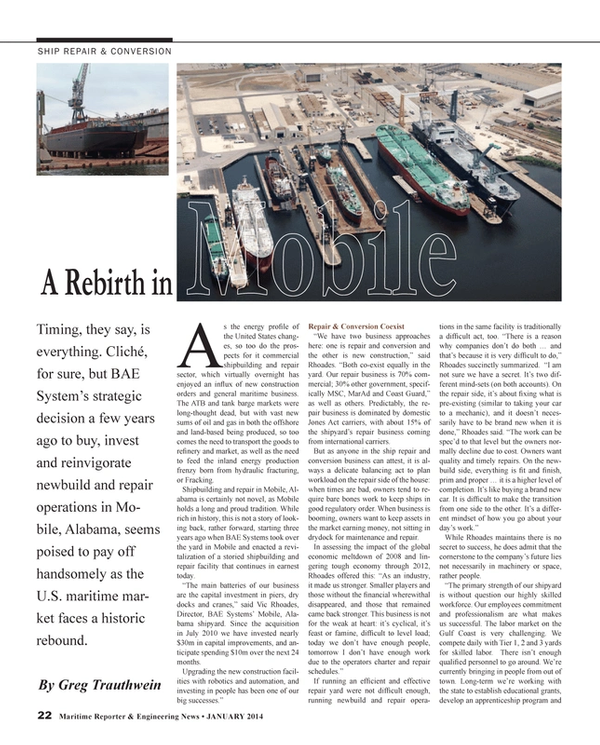 While rich in history, this is not a story of looking back, rather forward, starting three years ago when BAE Systems took over the yard in Mobile and enacted a revitalization of a storied shipbuilding and repair facility that continues in earnest today. “The main batteries of our business are the capital investment in piers, dry docks and cranes,” said Vic Rhoades, Director, BAE Systems’ Mobile, Alabama shipyard. Since the acquisition in July 2010 we have invested nearly $30m in capital improvements, and anticipate spending $10m over the next 24 months. “We have two business approaches here: one is repair and conversion and the other is new construction,” said Rhoades. “Both co-exist equally in the yard. Our repair business is 70% commercial; 30% other government, specifically MSC, MarAd and Coast Guard,” as well as others. Predictably, the repair business is dominated by domestic Jones Act carriers, with about 15% of the shipyard’s repair business coming from international carriers. But as anyone in the ship repair and conversion business can attest, it is always a delicate balancing act to plan workload on the repair side of the house: when times are bad, owners tend to require bare bones work to keep ships in good regulatory order. When business is booming, owners want to keep assets in the market earning money, not sitting in drydock for maintenance and repair. While Rhoades maintains there is no secret to success, he does admit that the cornerstone to the company’s future lies not necessarily in machinery or space, rather people. One key to finding and retaining good people is maintaining a steady log of business, and with the addition of the new construction business BAE Systems aims to do just that. The formula to date appears successful: when Rhoades came onboard three years ago when BAE Systems acquired the yard, the workforce was just shy of 500; today the workforce is 850 full time and 200 temporary employees. While BAE Systems continues to make a number of tangible investments in its Mobile facility, perhaps the most significant was the resurrection of its new construction business, bringing back Gene Caldwell as its director of new construction. Caldwell is well suited for the task at hand, given the ripe markets before him and the high level of investment from BAE Systems. While the current newbuild orderbook is diverse and impressive, the core revolves around energy, specifically the shale gas boom and its dramatic impact on the business and that of energy transportation in general. “They get it (oil) down to the Gulf of Mexico refineries (from the pipeline) and the refineries can’t handle all of the volume, hence the need for the tankers to transport it to other refineries when it comes out of the pipeline,” said Caldwell. A second Platform Supply Vessel for GulfMark. : The 300-Class DP2 PSVs for Gulfmark were designed by MMC Ship Design and Marine Consulting, Ltd. of Poland and will be based on similar PSV currently under construction for GulfMark abroad. The vessels will be U.S. flagged and will support the anticipated future demand in the Gulf of Mexico offshore market and other areas around the world and will be delivered in 2014.